The Answer of John Atkins Esquire, late Tracy, to the Appeal of Charles Reynell Esquire, was brought in. As was likewise, the Answer of Henry Earl of Shelburne, to the Appeal of Edward Birmingham and others. The House being moved, "That a Day may be appointed, for hearing the Cause wherein Charles Reynell Esquire is Appellant, and John Atkins Esquire Respondent:"
It is Ordered, That this House will hear the said Cause, by Counsel, at the Bar, on Monday Sevennight. Knowlings et al. take the Oaths to be naturalized. Margaret Knowlings, John Caspar Ries, Theophilus Pritzler, and George Frederick Smith, took the Oaths appointed, in order to their Naturalization. Liebenrood et al. Nat. Bill. Hodie 2a vice lecta est Billa, intituled, "An Act for naturalizing John Georg Liebenrood and Bartholomew Christopher Lutyens." E. Fitzwalter. L. Bp. Hereford. Ordered, That the Petition of the Several Persons praying to be added to the said Bill, be referred to the same Committee. The House being moved, "That Samuel Moore Gentleman may be permitted to enter into a Recognizance for Dame Ellis Aylmer, on account of her Appeal depending in this House; she being in Ireland:"
It is Ordered, That the said Samuel Moore may enter into a Recognizance for the Appellant, as desired. The like Motion and Order, for John Gordon of London Esquire to enter into a Recognizance for Sir John Gordon of Embo Baronet; he being in Scotland. Blyke, for Bryce and others. The like Motion and Order, for Samuel Blyke of London Gentleman to enter into a Recognizance for Ninian Bryce and others; for the same Reason. Ouchterlony, for Fullerton and others. The like Motion and Order, for George Ouchterlony Esquire to enter into a Recognizance for William Fullerton and others; for a Reason of the same Nature. The House was informed, "That a Person attended, in order to deliver in several Papers and Proceedings, in the Cause wherein Sir William Barker Baronet is Appellant, and Thomas Ivers Gentleman Respondent." He was thereupon called in, and delivered the said Papers and Proceedings; having first attested, upon Oath, at the Bar, "That the same were true Copies, he having examined them with the Originals in the proper Offices in Ireland." Dominus Cancellarius declaravit præsens Parliamentum continuandum esse usque ad & in Diem Veneris, septimum diem instantis Decembris, hora undecima Auroræ, Dominis sic decernentibus. The Earl of Findlater reported from the Lords Committees to whom the Bill, intituled, "An Act for naturalizing John Georg Liebenrood and Bartholomew Christopher Lutyens," was committed: "That they had considered the said Bill, and examined the Allegations thereof, which they found to be true; and that the Committee had gone through the Bill, and made some Amendments thereunto." Upon reading the Petition and Appeal of Patrick Davidson of Woodmiln Esquire; complaining of Two Interlocutors of the Lords of Session in Scotland, of the 6th of December 1738, and the 16th of November last, made on the Behalf of Alexander Watson; and praying, "That the same may be reversed; and that the Appellant may have such Relief in the Premises as to the great Wisdom of this House shall seem meet:"
It is Ordered, That the said Alexander Watson may have a Copy of the said Appeal; and he is hereby required to put in his Answer thereunto, in Writing, on or before Friday the 4th Day of January next; and that Service of this Order on the said Alexander Watson personally, or his Procurators or Agents before the said Court of Session, be deemed good Service. Baillie to enter into Recognizance for Vise. Arthburtnot. The House being moved, "That Alexander Baillie, of Lyon's-Inn, in the County of Middlesex, Gentleman, may be permitted to enter into a Recognizance for John Lord Viscount Arthburtnot and others, on account of their Appeal depending in this House; they residing in Scotland:"
It is Ordered, That the said Alexander Baillie may enter into a Recognizance for the Appellants, as desired. With a Bill, intituled, "An Act for continuing the Duties upon Malt, Mum, Cyder, and Perry, in that Part of Great Britain called England; and for granting to His Majesty certain Duties upon Malt, Mum, Cyder, and Perry, in that Part of Great Britain called Scotland, for the Service of the Year One Thousand Seven Hundred and Forty;" to which they desire the Concurrence of this House. Dominus Cancellarius declaravit præsens Parliamentum continuandum esse usque ad et in diem Mercurii, duodecimum diem instantis Decembris, hora undecima Auroræ, Dominis sic decernentibus. Reynell's Petition to put off his Cause rejected. A Petition of Charles Reynell was presented, and read; praying, "In regard the Case upon his Appeal, to which John Atkyns is Respondent, consists of many Points, and is very long; that the Hearing thereof may be put off till after the approaching Recess:"
And another Petition of the same Appellant was presented, and read; setting forth, "That several Writings in the Respondent's Custody will be ready to be produced at the Hearing of the said Cause;" and praying, "That the said Writings may be ordered to be produced at the said Hearing." And thereupon the said Agents were again called in, and heard at the Bar; as also the Petitioner, who admitted the Writings were not produced at the Hearing below. Ordered, That both the said Petitions be rejected. With a Bill, intituled, "An Act for granting an Aid to His Majesty, by a Land Tax, to be raised in Great Britain, for the Service of the Year One Thousand Seven Hundred and Forty;" to which they desire the Concurrence of this House. L. Craven & al. Petition referred to Judges. 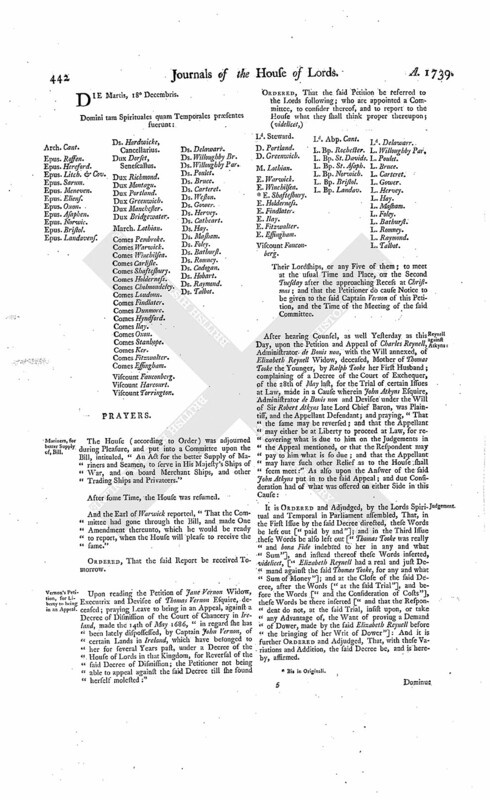 It is Ordered, That the Consideration of the said Petition be, and is hereby, referred to the Lord Chief Justice of the Court of King's Bench and the Lord Chief Justice of the Court of Common Pleas; who are forthwith to summon all Parties concerned in the Bill, and, after hearing them, to report to the House the State of the Case, with their Opinion thereupon, under their Hands, and whether all Parties that may be concerned in the Consequences of the Bill have signed the Petition; and also that the Judges, having perused the Bill, do sign the same. Talbot & Ux. Petition referred to Judges. It is Ordered, That the Consideration of the said Petition be, and is hereby, referred to the Lord Chief Justice of the Court of Common Pleas and the Lord Chief Baron of the Court of Exchequer; with the usual Directions, according to the Standing Order. 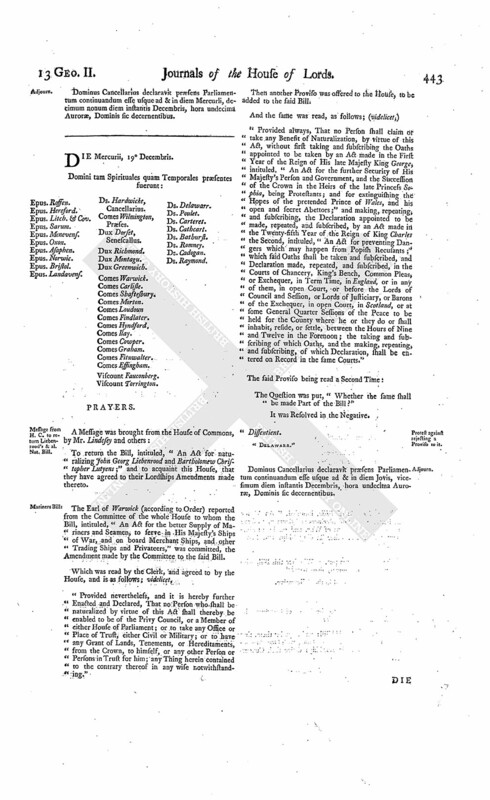 A Petition of Samuel Langley an Infant, Thomas Cotton, and John Johnston, Respondents to the Appeal of Valentine Quin Esquire, was presented, and read; setting forth, "That, as soon as the Hearing of this Cause was put off by this House, the Petitioners wrote pressingly to Ireland for their Papers; and, by a Letter from their Solicitor at Dublin, dated the 1st Instant, the Petitioners are informed, that he had returned the same; but they are not yet arrived, without which they cannot safely proceed to a Hearing;" and praying, "That the same may be put off to such further Time as their Lordships shall think proper." Ordered, That the said Hearing be put off to the First vacant Day for Causes after the Recess at Christmas; and that the Petitioners do pay the Appellant Ten Guineas, for the Costs of the Day. A Petition of James Lenox Naper and William Naper Esquires, Respondents to the Appeal of Robert Plunket Esquire, commonly called Earl of Fingall, and others, was presented, and read; praying, "In regard the Cause in the Court of Chancery in Ireland is, pursuant to the Order of this House, revived against James Arthur Plunket Esquire, Son and Heir of the said Robert Plunket, lately deceased; that the said Son may be obliged to revive the said Appeal within such Time as this House shall think proper." Ordered, That the said James Arthur Plunket do cause the said Appeal to be revived accordingly within Five Weeks; and that Service of this Order on his Agent or Six Clerk in the said Court be deemed good Service. Hodie 2a vice lecta est Billa, intituled, "An Act for continuing the Duties upon Malt, Mum, Cyder, and Perry, in that Part of Great Britain called England; and for granting to His Majesty certain Duties upon Malt, Mum, Cyder, and Perry, in that Part of Great Britain called Scotland, for the Service of the Year One Thousand Seven Hundred and Forty." Liebenrood & al. Nat. Bill. Hodie 3a vice lecta est Billa, intituled, "An Act for naturalizing John Georg Liebenrood and Bartholomew Christopher Lutyens." To carry down the said Bill, and acquaint them, that the Lords have agreed to the same, with several Amendments, to which their Lordships desire their Concurrence. Baillie to enter into Recognizance for Davidson. The House being moved, "That Alexander Baillie Gentleman may be permitted to enter into a Recognizance for Patrick Davidson Esquire, on account of his Appeal depending in this House; he residing in Scotland:"
It is Ordered, That the said Alexander Baillie may enter into a Recognizance for the Appellant, as desired. The House was informed, "That George Lacy attended, in order to deliver in Papers and Proceedings, in the Cause wherein Sir William Barker Baronet is Appellant, and Thomas Ivers Respondent:"
Dominus Cancellarius declaravit præsens Parliamentum continuandum esse usque ad & in diem Jovis, decimum tertium diem instantis Decembris, hora undecima Auroræ, Dominis sic decernentibus. Viscount Fauconberg. Ds. Willoughby Br. Hodie 2a vice lecta est Billa, intituled, "An Act for granting an Aid to His Majesty, by a Land Tax, to be raised in Great Britain, for the Service of the Year One Thousand Seven Hundred and Forty." Ordered, That the said Bill be committed to a Committee of the whole House To-morrow. 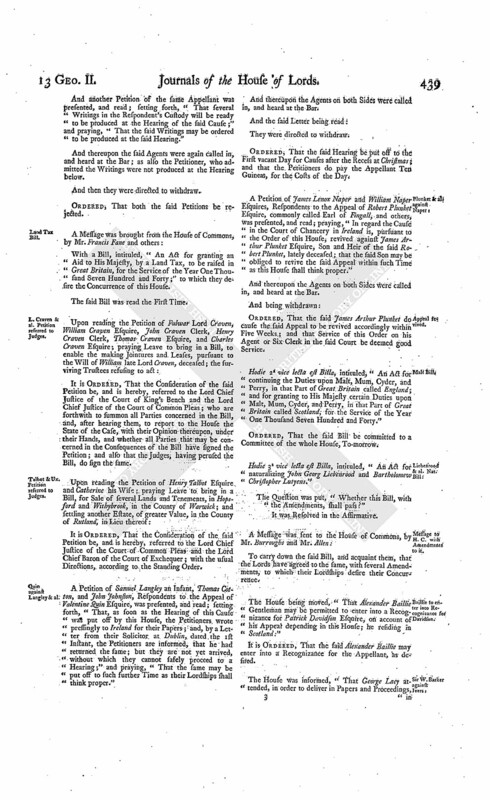 The House (according to Order) was adjourned during Pleasure, and put into a Committee upon the Bill, intituled, "An Act for continuing the Duties upon Malt, Mum, Cyder, and Perry, in that Part of Great Britain called England; and for granting to His Majesty certain Duties upon Malt, Mum, Cyder, and Perry, in that Part of Great Britain called Scotland, for the Service of the Year One Thousand Seven Hundred and Forty." Dominus Cancellarius declaravit præsens Parliamentum continuandum esse usque ad & in diem Veneris, decimum quartum diem instantis Decembris, hora undecima Auroræ, Dominis sic decernentibus. Hodie 3a vice lecta est Billa, intituled, "An Act for continuing the Duties upon Malt, Mum, Cyder, and Perry, in that Part of Great Britain called England; and for granting to His Majesty certain Duties upon Malt, Mum, Cyder, and Perry, in that Part of Great Britain called Scotland, for the Service of the Year One Thousand Seven Hundred and Forty." The House (according to Order) was adjourned during Pleasure, and put into a Committee upon the Bill, intituled, "An Act for granting an Aid to His Majesty, by a Land Tax, to be raised in Great Britain, for the Service of the Year One Thousand Seven Hundred and Forty." And the Lord Willoughby of Parham reported from the said Committee, "That they had gone through the Bill, and directed him to report the same to the House, without any Amendment." Proceedings, &c. of the Commissioners of Westminster Bridge delivered. The House being informed, "That Sir Joseph Ayloffe, Clerk to the Commissioners for building a Bridge at Westminster, attended:"
"The Proceedings of the said Commissioners, from the 15th February 1738, to the 14th November 1739, both inclusive." Also, "Contracts made by the same Commissioners, from the 15th of February 1738, to the 14th November 1739, both inclusive." And likewise, "Accompts of the Treasurer to the said Commissioners, from the 15th of February 1738, to the 14th November 1739, both inclusive." And the Titles of the said Proceedings, Contracts, and Accompts, were read. Mariners, for the better Supply of, Bill. With a Bill, intituled, "An Act for the better Supply of Mariners and Seamen, to serve in His Majesty's Ships of War, and on board Merchant Ships, and other Trading Ships and Privateers;" to which they desire the Concurrence of this House. 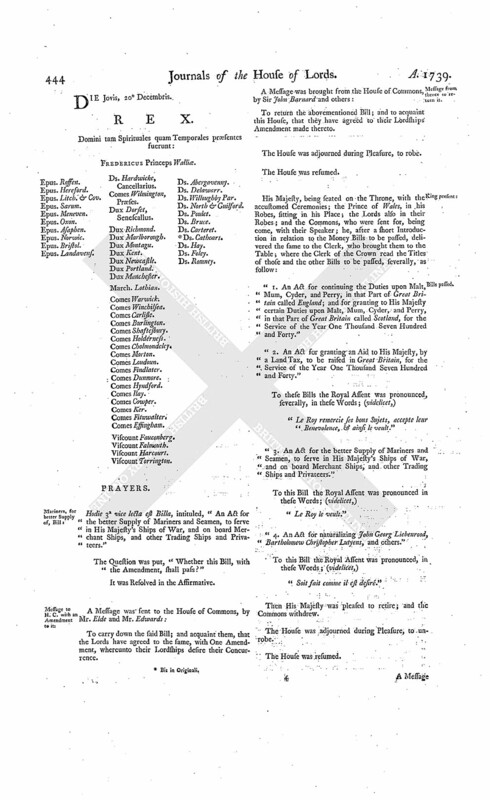 It is Ordered and Adjudged, by the Lords Spiritual and Temporal in Parliament assembled, That the said Order complained of in the said Appeal be, and the same is hereby, reversed: And it is further Ordered, That the Respondents Bill be, and the same is hereby, dismissed out of the said Court of Great Sessions, with Costs, to be taxed by the proper Officer of the said Court. Dominus Cancellarius declaravit præsens Parliamentum continuandum esse usque ad & in diem Lunæ, decimum septimum diem instantis Decembris, hora undecima Auroræ, Dominis sic decernentibus. Hodie 3a vice lecta est Billa, intituled, "An Act for granting an Aid to His Majesty, by a Land Tax, to be raised in Great Britain, for the Service of the Year One Thousand Seven Hundred and Forty." Hodie 2a vice lecta est Billa, intituled, "An Act for the better Supply of Mariners and Seamen, to serve in His Majesty's Ships of War, and on board Merchant Ships, and other Trading Ships and Privateers." Ordered, That the said Bill be committed to a Committee of the whole House, To-morrow; and the Lords to be summoned. It is Ordered, That the further Hearing of the said Cause be adjourned till To-morrow; and the Counsel to be called in at One a Clock. Dominus Cancellarius declaravit præsens Parliamentum continuandum esse usque ad & in diem Martis, decimum octavum diem instantis Decembris, hora undecima Auroræ, Dominis sic decernentibus. Mariners, for better Supply of, Bill. The House (according to Order) was adjourned during Pleasure, and put into a Committee upon the Bill, intituled, "An Act for the better Supply of Mariners and Seamen, to serve in His Majesty's Ships of War, and on board Merchant Ships, and other Trading Ships and Privateers." And the Earl of Warwick reported, "That the Committee had gone through the Bill, and made One Amendment thereunto, which he would be ready to report, when the House will please to receive the same." Vernon's Petition, for Liberty to bring in an Appeal. 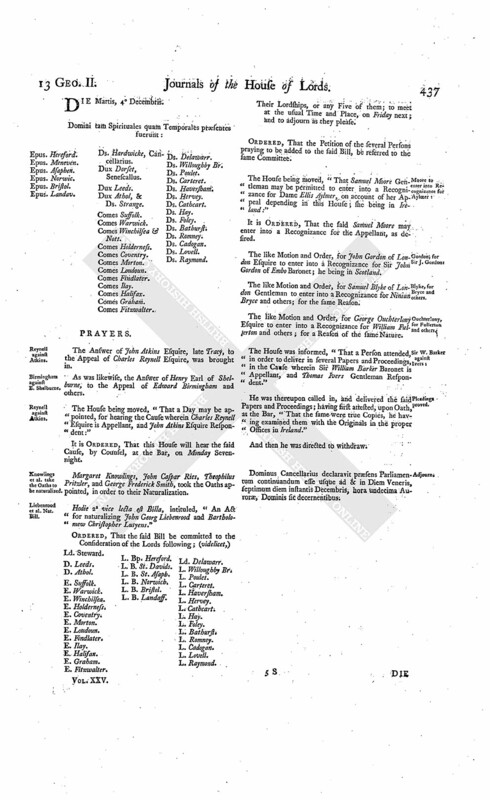 Upon reading the Petition of Jane Vernon Widow, Executrix and Devisee of Thomas Vernon Esquire, deceased; praying Leave to bring in an Appeal, against a Decree of Dismission of the Court of Chancery in Ireland, made the 14th of May 1686, "in regard she has been lately dispossessed, by Captain John Vernon, of certain Lands in Ireland, which have belonged to her for several Years past, under a Decree of the House of Lords in that Kingdom, for Reversal of the said Decree of Dismission; the Petitioner not being able to appeal against the said Decree till she found herself molested." Viscount Fauconberg. Ld. Abp. Cant. L. Bp. Landav. Ld. Delawarr. Their Lordships, or any Five of them; to meet at the usual Time and Place, on the Second Tuesday after the approaching Recess at Christmas; and that the Petitioner do cause Notice to be given to the said Captain Vernon of this Petition, and the Time of the Meeting of the said Committee. 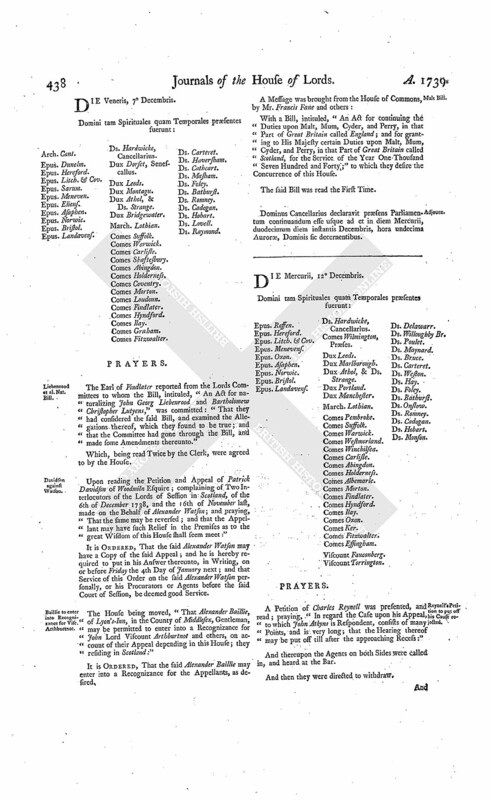 It is Ordered and Adjudged, by the Lords Spiritual and Temporal in Parliament assembled, That, in the First Issue by the said Decree directed, these Words be left out ["paid by and"]; and in the Third Issue these Words be also left out ["Thomas Tooke was really and bona Fide indebted to her in any and what Sum"], and instead thereof these Words inserted, videlicet, ["Elizabeth Reynell had a real and just Demand against the said Thomas Tooke, for any and what Sum of Money"]; and at the Close of the said Decree, after the Words ["at the said Trial"], and before the Words ["and the Consideration of Costs"], these Words be there inserted ["and that the Respondent do not, at the said Trial, insist upon, or take any Advantage of, the Want of proving a Demand of Dower, made by the said Elizabeth Reynell before the bringing of her Writ of Dower"]: And it is further Ordered and Adjudged, That, with these Variations and Addition, the said Decree be, and is hereby, affirmed. Dominus Cancellarius declaravit præsens Parliamentum continuandum esse usque ad & in diem Mercurli, decimum nonum diem instantis Decembris, hora undecima Auroræ, Dominis sic decernentibus. Message from H. C. to return Liebenrood's & al. Nat. Bill. To return the Bill, intituled, "An Act for naturalizing John Georg Liebenrood and Bartholomew Christopher Lutyens;" and to acquaint this House, that they have agreed to their Lordships Amendments made thereto. The Earl of Warwick (according to Order) reported from the Committee of the whole House to whom the Bill, intituled, "An Act for the better Supply of Mariners and Seamen, to serve in His Majesty's Ships of War, and on board Merchant Ships, and other Trading Ships and Privateers," was committed, the Amendment made by the Committee to the said Bill. 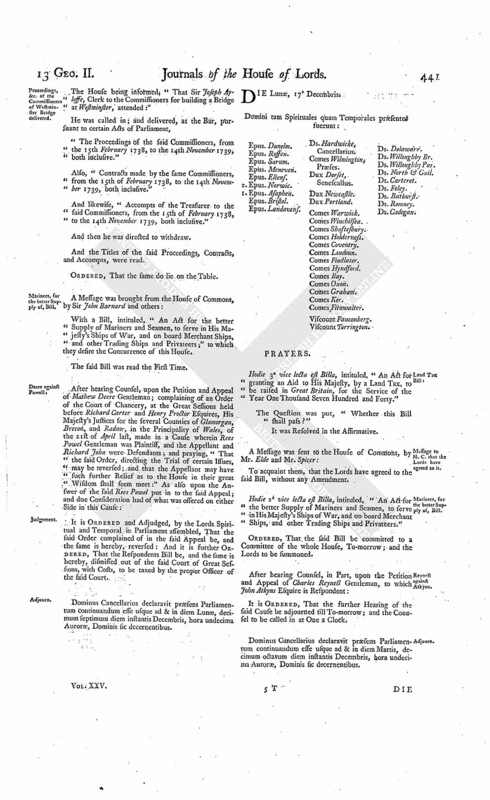 "Provided nevertheless, and it is hereby further Enacted and Declared, That no Person who shall be naturalized by virtue of this Act shall thereby be enabled to be of the Privy Council, or a Member of either House of Parliament; or to take any Office or Place of Trust, either Civil or Military; or to have any Grant of Lands, Tenements, or Hereditaments, from the Crown, to himself, or any other Person or Persons in Trust for him; any Thing herein contained to the contrary thereof in any wise notwithstanding." Then another Proviso was offered to the House, to be added to the said Bill. 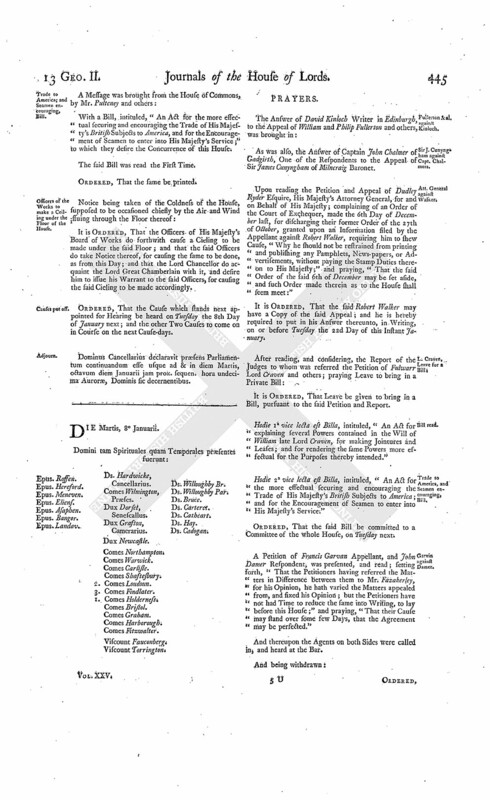 "Provided always, That no Person shall claim or take any Benefit of Naturalization, by virtue of this Act, without first taking and subscribing the Oaths appointed to be taken by an Act made in the First Year of the Reign of His late Majesty King George, intituled, "An Act for the further Security of His Majesty's Person and Government, and the Succession of the Crown in the Heirs of the late Princess Sophia, being Protestants; and for extinguishing the Hopes of the pretended Prince of Wales, and his open and secret Abettors;" and making, repeating, and subscribing, the Declaration appointed to be made, repeated, and subscribed, by an Act made in the Twenty-fifth Year of the Reign of King Charles the Second, intituled, "An Act for preventing Dangers which may happen from Popish Recusants;" which said Oaths shall be taken and subscribed, and Declaration made, repeated, and subscribed, in the Courts of Chancery, King's Bench, Common Pleas, or Exchequer, in Term Time, in England, or in any of them, in open Court, or before the Lords of Council and Session, or Lords of Justiciary, or Barons of the Exchequer, in open Court, in Scotland, or at some General Quarter Sessions of the Peace to be held for the County where he or they do or shall inhabit, reside, or settle, between the Hours of Nine and Twelve in the Forenoon; the taking and subscribing of which Oaths, and the making, repeating, and subscribing, of which Declaration, shall be entered on Record in the same Courts." The Question was put, "Whether the same shall be made Part of the Bill?" Protest against rejecting a Proviso to it. Dominus Cancellarius declaravit præsens Parliamentum continuandum esse usque ad & in diem Jovis, vicesimum diem instantis Decembris, hora undecima Auroræ, Dominis sic decernentibus. Hodie 3a vice lecta est Billa, intituled, "An Act for the better Supply of Mariners and Seamen, to serve in His Majesty's Ships of War, and on board Merchant Ships, and other Trading Ships and Privateers." The Question was put, "Whether this Bill, with the Amendment, shall pass?" To carry down the said Bill; and acquaint them, that the Lords have agreed to the same, with One Amendment, whereunto their Lordships desire their Concurrence. Message from thence to return it. To return the abovementioned Bill; and to acquaint this House, that they have agreed to their Lordships Amendment made thereto. "1. An Act for continuing the Duties upon Malt, Mum, Cyder, and Perry, in that Part of Great Britain called England; and for granting to His Majesty certain Duties upon Malt, Mum, Cyder, and Perry, in that Part of Great Britain called Scotland, for the Service of the Year One Thousand Seven Hundred and Forty." "2. 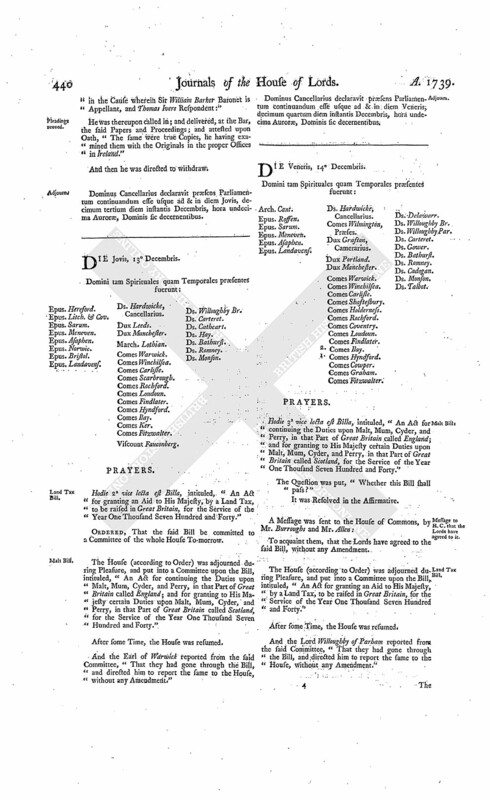 An Act for granting an Aid to His Majesty, by a Land Tax, to be raised in Great Britain, for the Service of the Year One Thousand Seven Hundred and Forty." "3. An Act for the better Supply of Mariners and Seamen, to serve in His Majesty's Ships of War, and on board Merchant Ships, and other Trading Ships and Privateers." "4. An Act for naturalizing John Georg Liebenrood, Bartholomew Christopher Lutyens, and others." Trade to America; and Seamen encouraging, Bill. With a Bill, intituled, "An Act for the more effectual securing and encouraging the Trade of His Majesty's British Subjects to America, and for the Encouragement of Seamen to enter into His Majesty's Service;" to which they desire the Concurrence of this House. Officers of the Works to make a Ceiling under the Floor of the House. It is Ordered, That the Officers of His Majesty's Board of Works do forthwith cause a Cieling to be made under the said Floor; and that the said Officers do take Notice thereof, for causing the same to be done, as from this Day; and that the Lord Chancellor do acquaint the Lord Great Chamberlain with it, and desire him to issue his Warrant to the said Officers, for causing the said Cieling to be made accordingly. Ordered, That the Cause which stands next appointed for Hearing be heard on Tuesday the 8th Day of January next; and the other Two Causes to come on in Course on the next Cause-days. Dominus Cancellarius declaravit præsens Parliamentum continuandum esse usque ad & in diem Martis, octavum diem Januarii jam prox. sequen. hora undecima Auroræ, Dominis sic decernentibus.